Polycarbonate Sheet - The One Stop Plastics Shop Ltd.
Tough and durable, polycarbonate is usually associated with applications requiring high impact or repeated use. Significantly stronger than plate glass and acrylic, polycarbonate sheet is a lightweight, economical glazing material that provides increased protection against high traffic use, vandalism and theft. Used extensively in architectural applications, polycarbonate is energy efficient, due to its excellent insulating qualities, when compared to glass of equal thickness. Polycarbonate allows up to 90 percent transmittance of solar energy and 88 percent of visible light. Tints and patterns can be added to help reduce heat gain and to enhance its use in architectural design applications. Sign grade polycarbonate is specially formulated to provide excellent resistance to the weathering effects of prolonged exposure to the sun. Along with its high impact characteristics, polycarbonate is a good choice for outdoor, and high use, sign applications. In security applications, polycarbonate laminates provide proven resistance to both physical and ballistic attacks. A variety of polycarbonate, and polycarbonate/acrylic, configurations offer different levels of protection ranging from containment up to UL Level 3 bullet resistance. Polycarbonate is more dimensionally stable than acrylic over a wide temperature range. And, compared to acrylic, it is only slightly less transparent. Standard polycarbonate doesn't weather well over time but additives and coatings can be incorporated that significantly increase the weatherability of the polycarbonate. Because its surface is soft, compared to acrylic, polycarbonate sheet is more prone to scratching. 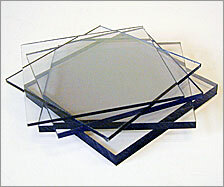 Abrasion-resistant coatings can be added to significantly reduce this shortcoming of polycarbonate.